Hello! This is Seikatsu Kakumei’s PR representative. This time, we’re going to look at a good use of regular Pepper robots for customer outreach. 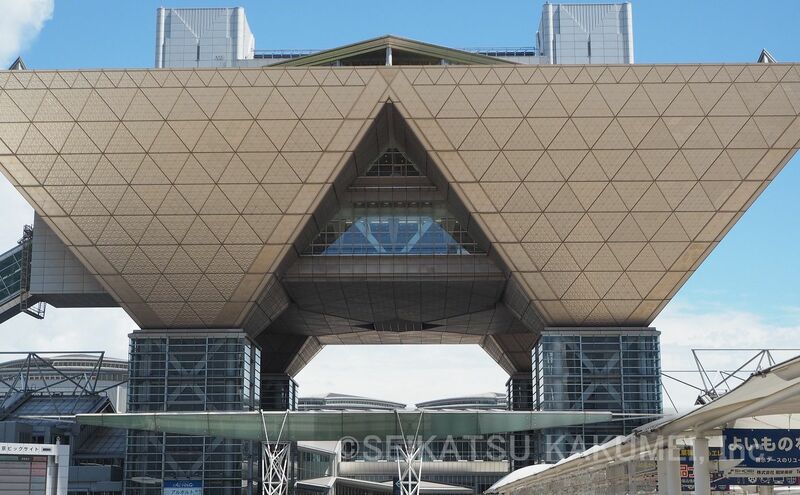 However, even without the latest in technology, using a regular Pepper with Seikatsu Kakumei’s robot event planning and operation skills, the goals of customer outreach and information have been achievable for many years now. 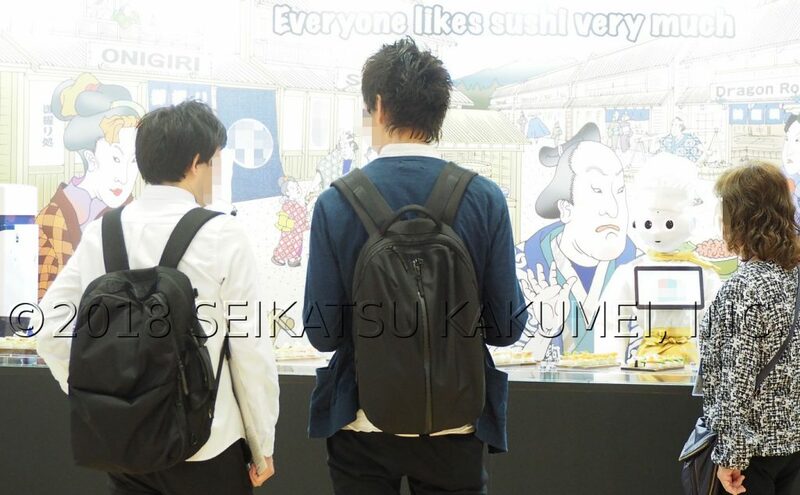 As they continue to further evolve, Seikatsu Kakumei’s robots are being used at even bigger and bigger booths. This case is an example of a company product information exhibit using one such regular Pepper. For this event, we were requested by a major food service equipment company, ranking number one in the country in market share. We accepted the order for brand recognition increase, branding, and product information dissemination at the company’s trade booth at FOOMA Japan 2018, at an international trade exhibition center. While the company is Japanese, they are aiming to increase their recognition among representatives from overseas, diving further into global business. Their hope for Pepper this time was to appeal to both Japanese and foreign guests at the same time. 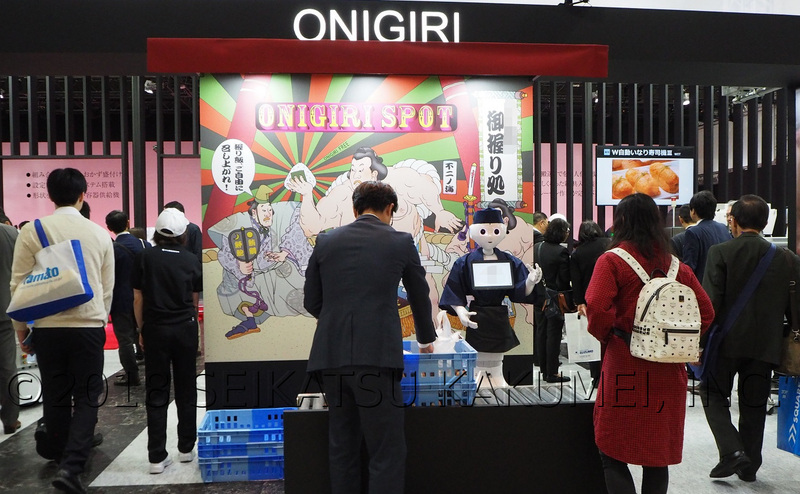 At the booth, in the section for national customers, Pepper, while dressed in a sushi chef’s costume and speaking in Kyoto dialect, gave booth information. At international trade fairs, simply renting a regular Pepper and placing it there isn’t a particularly effective approach. People aren’t going to be drawn over just by the novel appearance of Pepper. Basic elements, such as its gestures and ways of speech, its dialogue contents, and costuming appropriate for the booth, in the same way as a human who calls out and gives information, require specialized training. With that, conversely, Pepper’s name recognition factor and essential informing ability begin to demonstrate synergy. With our specialized staff who have prepared over 100 robot events, this isn’t unusual. Catching the eyes and ears of customers with pronunciation tuning and gesture development, impactful presentation scripts were created. Additionally, at the client’s request, it was also delicately tuned to speak in Kyoto dialect. With Pepper’s pronunciation and movements adjusted, the uniqueness of the Kyoto dialect was successfully reproduced. 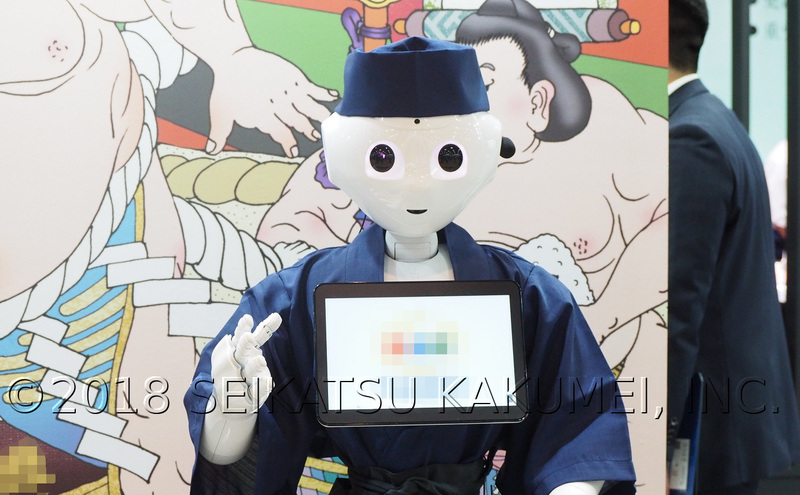 As it is a Japanese-style food service equipment company, Pepper wore the recognizable costume of a sushi chef. The company and its booth, consistent with its values of world harmony, saw this result: eyes and ears watched and listened attentatively as crowds gathered around the booth. 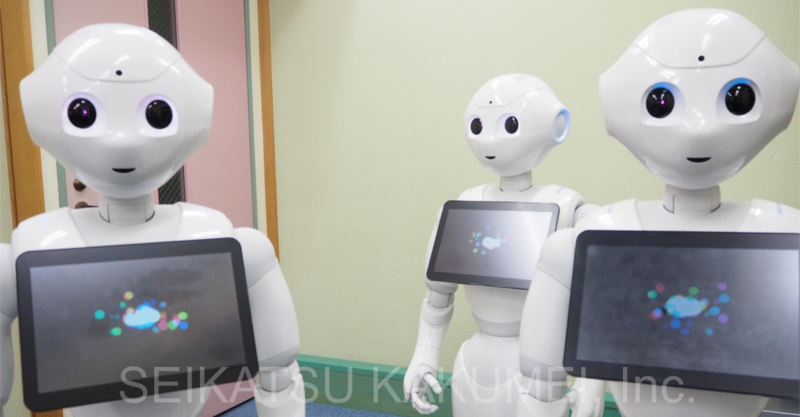 At the booth, during the session for foreign customers, two Pepper robots wore cook uniforms and spoke English, providing booth information in stereo. For customers from overseas, Pepper is a rare novelty all on its own, but for achieving the booth’s purposes, the effect isn’t so different from the one it has on Japanese customers. With ease of understanding in mind, these two robots were dressed in Western-style chef costumes. As a result, numerous foreign company representatives came to visit, and were seen taking pictures and videos which were sent immediately. The booth was a great success. It seems to have played its part in reaching the exhibiting company’s goals of customer outreach, recognition, and branding. 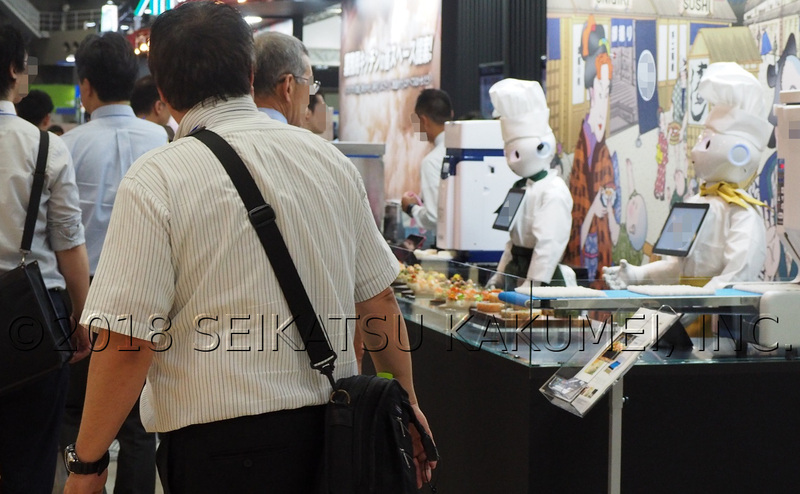 In this blog, we’ve seen how effective the results can be when using a regular Pepper with Seikatsu Kakumei’s robot event planning and production to provide information at an international trade show. Recently, at Seikatsu Kakumei (perhaps because of our Robot Party Reception Service, the “robot that can say anything”), we’ve been told that our company has a reputation for strength when it comes to systems and software. However, in reality, we’re a company that has accumulated a lot of detailed know-how for operating Pepper and other robot events, planning performances, and emphasizing contents. When using Seikatsu Kakumei’s event robot planning and creation, even if you’re not using the latest in technology products such as Robot Party Reception Service, the robot doesn’t need to stop at a mere bit of liveliness — it can be made to act in a helpful manner. That’s why, in situations where robots are really useful, Seikatsu Kakumei polishes this type of technology. We are increasingly requested at trade shows, both international and nationwide, as well as at local venues. In addition to the above ‘simple’ effort, we have loads of experience with more detailed events. If perhaps you’re thinking, “I want to try using a robot at my event, too”, please be sure to consult with our staff. We will use our robot knowledge in a way that matches your event or trade exposition. ・Acquire new national and international customers by informing them of the company and its products. ・With that goal of customer outreach in mind, provide essential product explanations. ・For foreign guests: 2 Pepper robots dressed as chefs called out and gave product explanations in both English and Japanese. ・For Japanese guests: Pepper, dressed as a sushi chef called out and gave product explanations in Kyoto dialect. Seikatsu Kakumei’s Pepper Works at Trade Shows? !